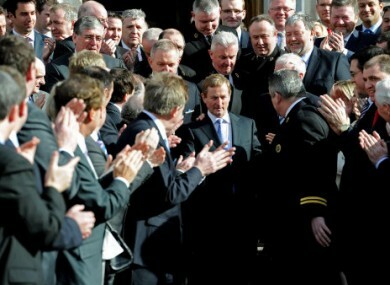 A mob of politicians: What is the collective noun for TDs? FIGURES FROM CENSUS 2011 show that the country’s population has now risen to over 4.5 million. To take into account the growth in population in certain areas of Ireland, a new Boundary Commission is set to redraw constituencies. There is also the likelihood – as promised by the Government in May – that the number of TDs in the next Dail Eireann will be reduced. Suggestions today put the reduction at 20 – do you think that’s too many or not enough? There are 166 TDs in the current Dail. Have your say here: How many TDs do you think should be in the next Dail? We shouldn't have any TDs at all - sure aren't we being run by the IMF anyway? Email “Poll: How many TDs should be in the next Dail?”. Feedback on “Poll: How many TDs should be in the next Dail?”.